Students at a nearly all-minority school have had enough of a self-described libertarian teacher displaying a Confederate banner and defending the slave-owning nation’s cause. 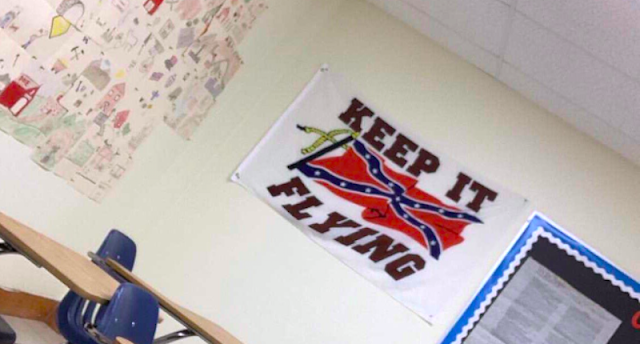 The head of a nonprofit group that represents charter schools said the teacher displays the banner, which shows the Confederate flag and the slogan, “Keep It Flying,” in the classroom of his advanced-placement American history course at Mater Academy in Hialeah Gardens, reported the Miami New Times. Current and former students told the newspaper the flag was placed on the wall as part of a lesson, but the unidentified teacher tried to antagonize them with right-wing views and defending the Confederacy as fighting for “states’ rights” and insisting the North “should have lost” the Civil War. School principal Jose Nuñez told the New Times that students were warned in advance that classroom subject matter would be provocative, and that the teacher would show the Confederate flag to spark debate. Nuñez said the flag was shown alongside pictures of civil rights heroes as part of a lesson on the evils of racism and intended to put the flag’s history into context.